I have been eagerly awaiting this year's Valentine's Day range from Lush. I pretty much adored everything from the collection last year, in particular the Prince Charming shower gel, so I had high hopes for this year. And, I hate to say this, but I was a little disappointed with the selection for 2016! Having said that, there area few things I picked up and would recommend those who fancy a pamper, or looking for gifts for loved ones this year. First thing's first, let's talk about Prince Charming. The shower gel last year was my absolute all time favourite product ever because it did wonders on my red, bumpy arms and transformed it into baby soft, touchable happiness. So imagine how much I freaked out when I found out Prince Charming had changed this year from a shower gel to a shower cream. Doesn't sound like a big difference, but when a product does so much good for your skin you never want it to change formula! I've had chance to use it now and, luckily, it is a fantastic shower cream. It is a lot thicker than the other creams Lush do for the shower, and this in turn makes it feel like a much more luxurious product to wash with. It lathers nicely and the scent is exactly the same as the old version - a kind of sweet, grapefruit smell. I haven't been using it long enough to see if it will have the same effect on my skin as the old version, I do have my fingers crossed though! Next up is Lover Lamp bath bomb. This smells divine. I have to stock up on these because they just smell so wonderful. The fragrance is very sweet but quite chocolatey with a citrus note to it. Lots of people have been comparing it to chocolate orange scent, but I think it's more sweet than that. It turns bathwater a milky white and disperses tiny heart confetti around. Plus, the bigger love hearts are cocoa butters that melt into the bath making it super silky soft. I reckon this is the best thing from the collection this year. Unicorn Horn bubble bar makes its return which is unsurprising as it was ridiculously popular last year. I hated the smell last year, it is a very strong floral with lavender which I hate however I grew to like it. After a break from the product, on re-sniffing it, I dislike the smell again. I really want to love this as it makes the most amazing and soft bubbles, plus it looks amazing. 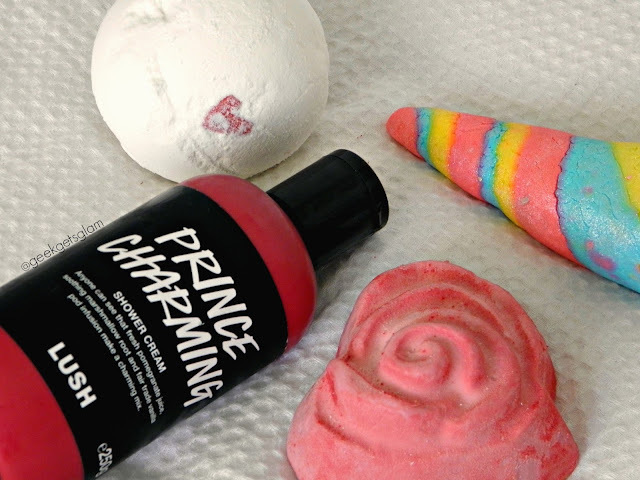 If you like Twilight bath bomb, you'll love this! I do love how bubble it makes the bath though, I just won't be repurchasing this one (unless I grow to like the smell again!). Finally, my last pick, I picked up the new soap which is called Roses All The Way. I love the concept behind this soap as it is Alice in Wonderland inspired - the roses themselves are white and have been painted pink like in the book! The fragrance of this one is lovely. It's a soft and sweet rose fragrance, which it actually borrows from the Lush face mask Rosey Cheeks. I'm not a fan of floral, but the sweeter notes in this one sell it to me. You're probably wondering what on Earth I'm so upset about when it appears I love the majority of the products released this year. Well, it's a really petty reason but, I'm annoyed that Oxford Street has exclusives of some amazing products. I want all of them. And if I don't get another Heart Throb bubbleroon in my life, I will cry. I wish every shop had the entire Valentine's Collection - it seems really small and (wait for this cracking pun) half-hearted of Lush to release a tiny collection. Aside from this, I highly recommend you pick up a Lover Lamp and the new Prince Charming shower cream, especially if you like the sweeter scents! I'm also a bit annoyed about the whole Oxford Street exclusive thing. I'm sure many people can't justify traveling all the way there just for some special lush stuff! They should release them online really so everyone gets a chance. Or at least rotate it around the stores so each location has the chance of having a nice special product that's not available elsewhere.